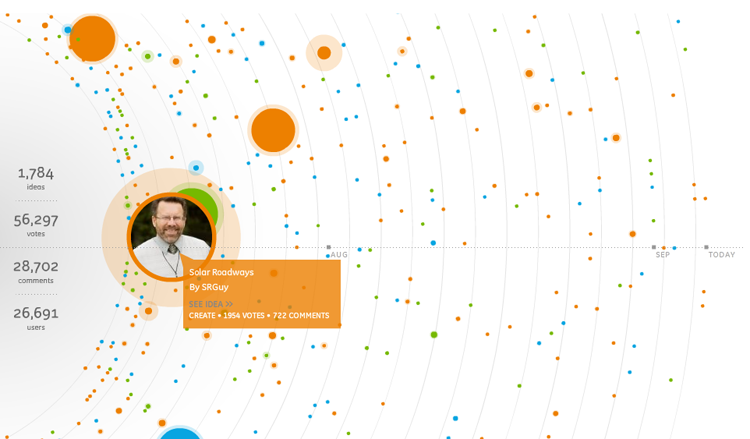 A beautiful visualization of ideas being submitted for GE’s Ecomagination challenge. In July, GE began taking ideas for it’s Ecomagination Challenge — an open call for ideas for saving the world, in three categories: renewables, grid efficiency, and eco buildings. In just six days, the entry and and voting window closes. What makes the contest more than just a do-gooder marketing scheme? There’s $200 million in seed grants at stake, awarded to the best ideas from the coffers of top-tier venture capital funds such as Kleiner Perkins. The ideas are arrayed as dots on a horizontal timeline; to see more of them, you simply spin the wheel, like a record. To get more information about an idea, you click on it, which takes you to a detailed project page. The more votes that an idea has received from readers, the larger the dot; the more comments an idea has received, the larger the halo around the dot. Additionally, each of the dots is color coded by its category (renewables, grid efficiency, and eco buildings), and you can also filter the ideas by category. It’s incredibly fun to play with, and superbly done. We only wish there was another layer of filtering, to making clicking on a dot feel a little less random. For example, when the ideas are actually judged, it would be great to see color coding of short list, long list, and finalist entries. As is, presenting the entries as a mass of dots over-privileges ideas that have simply received a lot of votes. And shouldn’t this contest be about finding diamonds in the rough? But as is, it can be really inspiring to see how nutty/smart/simple some of the ideas are–ranging from solar-panel roads to social networks that broadcast your energy consumption, making energy saving into a keeping-up-with-the-Joneses contest.